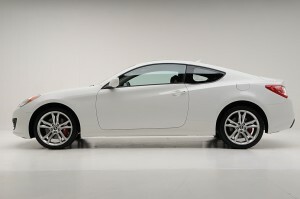 Hyundai’s Genesis Coupe garnered a lot of good press and gearhead interest from the get go. And it seems to be fully justified and also understandable. 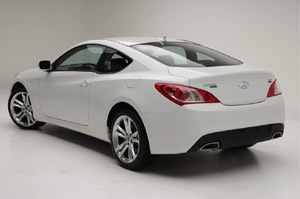 The Hyundai Genesis is well styled (enough), rear wheel drive, and above all, reasonably priced. It’s a car that a young tuner-oriented kid can sink their teeth into, and there’s already a pretty decent aftermarket for the car. And Hyundai just added a new wrinkle to the mix with its announcement that it will be making a Genesis Coupe 2.0T R-Spec for 2010. With a starting price of just $23,750 and hitting the dealer showrooms fairly stripped down, that way being all the better for future customization by the end user, the R-Spec promises to be even more of what the aftermarket tuner wants. That stripper equipment list for the R-Spec includes a 2.0-liter turbocharged engine that cranks out 210 horsepower, not bad as a starting point. The Coupe also comes with a six-speed manual transmission only, there is no automatic option. There are also 19 inch alloy wheels mounted with Bridgestone Potenza RE050A tires, and in back of the wheels are Brembo brakes; 13.4 inchers up front and 13.0s out back. The 2010 Hyundai Genesis Coupe 2.0T R-Spec also has a ‘track-tuned’ suspension (whatever that might be) and Torsen-type limited-slip diff that isn’t in the standard Coupe. Naturally there’s R-Spec badging so everyone knows how cool you are. The R-Spec Coupe isn’t totally stripped down, however. It does include keyless entry, front, side and side curtain airbags, active front head restraints, air conditioning, leather-wrapped steering wheel and shift knob, power windows and door locks, an MP3-capable six-speaker stereo system with iPod/USB connectivity and projector beam headlamps. The R-Spec package is said to offer as much performance as Hyundai’s Track model, but at a $3,000 less, which will give the prospective buyer more headroom, cash-wise, to spend wherever they’d like. With an extra $3K in your budget, things like larger turbos, aftermarket intercoolers, bigger than necessary audio/video systems and the like. The R-Spec exists to attract the tuner market. 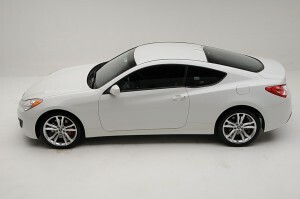 The new for 2010 Hyundai Genesis Coupe 2.0T R-Spec will make its official U.S. rollout at the upcoming 2009 SEMA Auto Show in Last Vegas, and will go on sale nationwide soon after. Too bad it’s only 68 lbs lighter than the Track model. Still a great deal for a RWD turbocharged coupe, especially since it shares the same basic engine design as the Mitsubishi 4B11 found in the Lancer Ralliart turbo (a GEMA-produced motor). If I had the money, this would be the sub-$25k car I’d buy. Should be the next 240SX in 5-10 years.